Versatility is one of the key factors what makes Barcelona so popular destination. You have countless museums for art lovers, a rich history dating back to Roman times, a beach right next to the city center, a multitude of parks and world-famous festivals & sports events. The neighborhoods of Barcelona differ a lot from one to another, each having their distinctive character. One loves the buzz of those lively, narrow streets of the Gothic Quarter, where as another prefers the spacious avenues of Eixample, and the third seeks to get away from the city center and relax at the beach front. In Barcelona, you can combine a city break with a relaxing beach holiday – the choice is yours. All these factors make Barcelona a top candidate as your next holiday destination! Airport bus, Aerobús, is the easiest way to get to the city center. The last stop is at the Catalonia Square, in front of the department store El Corte Inglés. It’s the official shuttle bus between the airport El Prat and the Catalonia Square. Different bus lines operate between different airport terminals, so choose either A1 or A2, depending if you go to terminal 1 or 2. The destination terminal reads in front of the bus (A1 for T1 and A2 for T2). The ride takes about 35 minutes and buses run frequently, every 5 or 10 minutes, so there is never a long waiting time. 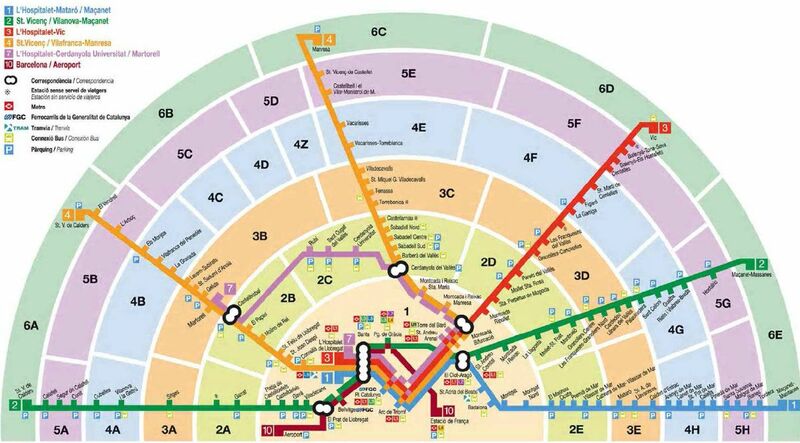 There are three other stops between the airport and the Catalonia Square, and two when going the opposite direction. The stops, tickets and more information can be found at aerobusbcn.com. There is a luggage rack inside the bus. Local traffic cards are not valid in Aerobús. A cheaper option than Aerobús, is the bus line number 46, that goes from terminal 1 and 2 to Plaça Espanya. Schedules you'll find at tmb.cat. Nightbuses N16 or N17 go to Catalonia Square. There aren't racks luggage racks like in Aerobús, so it might be uncomfortable to take a local bus if you travel with plenty of luggage. Trains operate from Terminal 2 only. Schedules you can check at renfe.com. The train ride takes 20 minutes to the main station Sants, and 27 minutes to the city centre (station: Passeig de Gracía). You can buy e.g. a T10 Travel Card at the airport ticket machine, use one trip for this, and you have nine left. T10 card for Zone 1 costs 10.20 euros (that covers the whole city center). Zone 2+ is needed for neighbor towns. mapametrobarcelona.net. Metro is also an option. It's more expensive than a normal metro ride, since a special Airport metro ticket is needed. Line L9 doesn't go to the city center, but you can change to other lines closer to the city. There are metro stations in both terminals. The vast sand stretch offers you plenty of beach where to choose your favorite spot from. There's a versatile selection of busier beaches to more quiet ones, find out more information about Barcelona beaches. There is an endless choice of activities in Barcelona. The city is full of parks where to have a picnic or spend the day by tasting Spanish delicacies on a foodwalk. Some of the most famous buildings in the world are located in Barcelona, such as the Sagrada Família Church, which a must-see site. A crafty way to save some money for extra spending, is to visit museums on free entrance on Sundays. On the other hand, if you're searching for fun for the whole family, Barcelona has plenty of activities for families with children of all ages. Sometimes you just can't be bothered to do touristic things and prefer to do the same things you do home. Some of the cinemas show films in their original language, or how about trying an outdoor cinema? Read more about all the tips for things to do in Barcelona. Barcelona is a fantastic city for shopping. You have a great selection from fashion designer shops to small artisan shops, and the price level is one of the lowest in Europe. Don't forget you have big seasonal sales twice a year. Read more about shopping tips. The city is heaven for foodies - sit down to one of the many Michelin-starred restaurants for an unforgettable dinner or enjoy a paella lunch on a sunny outside terrace. Read more about Gate98 favorite restaurants in Barcelona. Barcelona has a vast number of different venues where to exercise during your holiday. Especially during a longer holiday you might feel an urge to do some physical strain. From gym day passes to bowling, check our tips where to do sports in Barcelona. Prices of restaurant services in the city are approximately on the same level as the average in the European Union, where as the hotel prices are somewhat higher than the average in the EU. Below are some examples of restaurant and hotel prices in Barcelona. Costs of hotel rooms are median prices at Booking.com. Staying at the right area is a very important decision on your holiday. Often you feel frustrated for choosing an area far from the key places you want to visit. Barcelona is a big city and there are many factors to take into consideration when choosing the right spot for you. Often you find the best price for accommodation from a bit further away from the city center, and the choice might still match with all your needs. From our where to stay section you'll find the pros and cons of each neighborhood in central Barcelona. Winter: The winter months from December to February are often rainy and the average daily high temperatures vary between 5-15°C. Spring: From March to May, the rains stop and the sun is out often. The daily high average temperature in March climbs up to 15-20°C, but in May, the daily high average temperature is already around 20 °C. Summer: From June to August, the sunshine is pretty much guaranteed. The daily high temperature climbs up to 30°C and over. Autumn: September is still a warm month and it’s often beach weather still throughout the month. The daily high temperature in September stays clearly above 20 °C. In mid October, the weather cools down to under 20°C and it starts to rain more often. In November, the average daily high temperature is already around 10°C.